Offering exceptional quality and value for money, this non-biological washing powder will deliver brilliant results on around 22 standard washes. The powder has been dermatologically tested and is effective even at 30ºC. 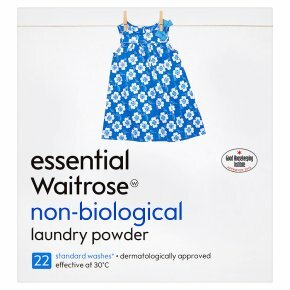 This pack contains 2.4kg of washing powder and is part of our essential Waitrose range. INGREDIENTS: Sodium Carbonate, Sodium Carbonate Peroxide (Sodium Carbonate Peroxide, Sodium Carbonate, Sodium Sulfate, Sodium Chloride, Sodium Silicate, Aqua (water)), sodium sulphate, Dodecylbenzene Sulfonic Acid (Dodecylbenzene Sulfonic Acid, Aqua (water), Sulfuric Acid), Zeolite (Sodium Aluminate, Aqua (water)), Sodium Silicate Solution (Aqua (water), Sodium Silicate), Sodium Silicate Powder (Sodium Silicate, Aqua (water)), Tetra Acetyl Ethylene Diamine (Tetra Acetyl Ethylene Diamine, Carboxymethyl Hydroxyethylcellulose), Polycarboxylate (Aqua (water), Polycarboxylate), C14-15 Pareth-7, Parfum, Etidronic Acid (Etidronic Acid, aqua, Phosphoric Acid), Optical Brightener (Optical Brightener, Aqua (water)), Carboxymethyl Cellulose (Carboxymethyl Cellulose, Sodium Chloride, Aqua (water)), Antifoam powder (Avena Sativa, Glyceryl Stearate, Dimethicone, Polyacrylic Acid), Polyethylene Glycol/polyester (Polyethylene Glycol/polyester, Aqua (water)). GHS07. Causes serious eye irritation.. If medical advice is needed, have product container or label at hand.. Keep out of reach of children.. Read label before use.. Wash hands thoroughly after handling.. IF IN EYES: Rinse cautiously with water for several minutes. Remove contact lenses, if present and easy to do. Continue rinsing.. If eye irritation persists: Get medical advice/attention.. Warning. Keep away from eyes. If product gets into eyes rinse thoroughly with water.. Rinse hands after use.. Do not ingest. If product is ingested then seek medical advice.. People with sensitive or damaged skin should avoid prolonged contact with the product.. Keep away from children.